Food was prepared and served by the wonderful team in the Community Kitchen at Hamilton House. 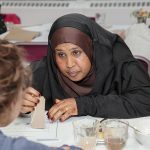 The delicious feast brought together the four partner organisations that have been collaborating on the project and the two groups of community participants: a group of Somali women in Easton and local residents of Knowle West. 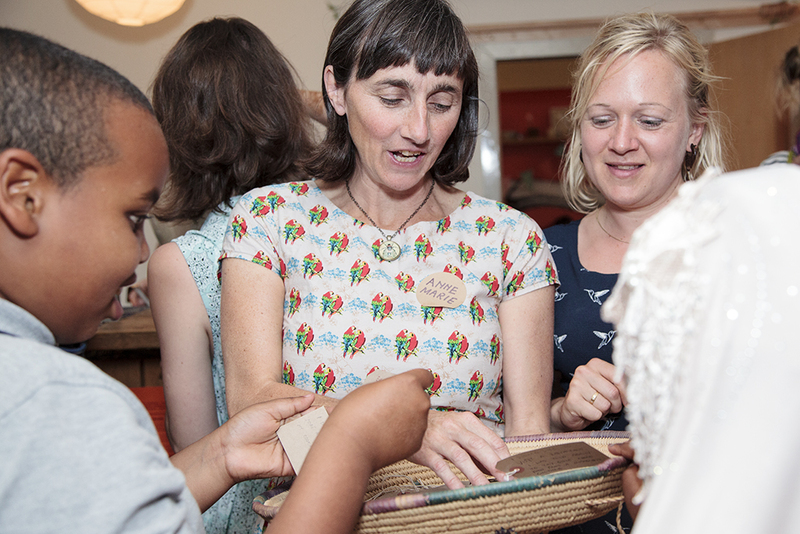 Participants were invited to bring along their families to share the work that we have been doing with them. We also invited local practitioners, community organisation representatives and councillors to the event. 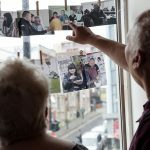 We worked with artist Anne-Marie Culhane, who we had commissioned to work with us to explore and reimagine community food spaces, to curate a beautiful and celebratory space for the event. 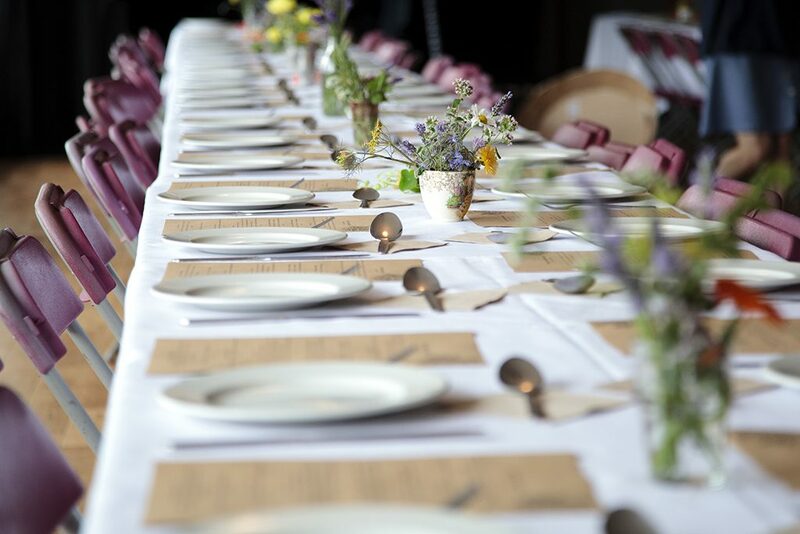 Tables were laid with white linen tablecloths and handpicked bunches of edible flowers. Around 60 people came and were served five courses of food and drinks. 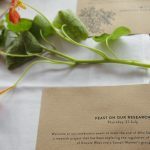 Tables were laid with white linen tablecloths and bunches of handpicked edible flowers and fresh herbs. 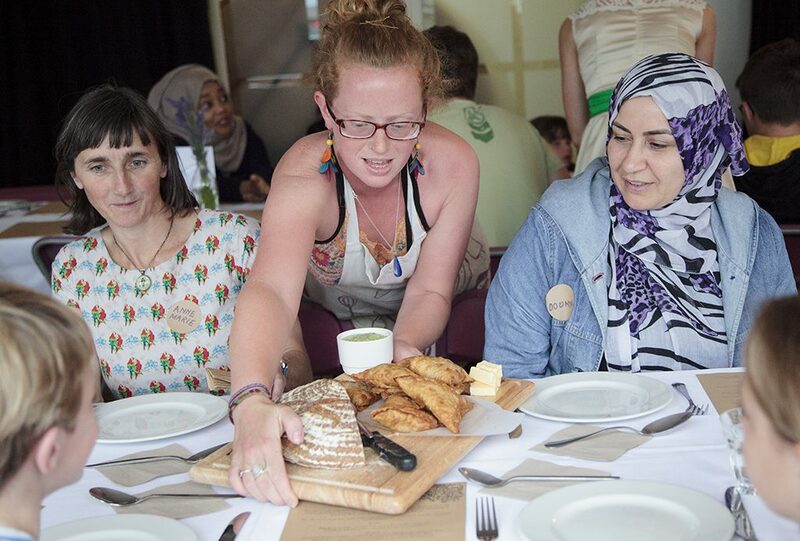 The menu reflected different phases of the research at the two main sites, one focusing primarily on Somali food cultures and the need for more culturally diverse and healthy street food, and the other on transforming urban food deserts in areas where even supermarkets are scarce. 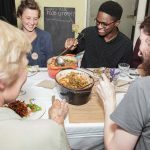 Both research groups shared the question ‘who decides what’s in my fridge?’ and the five course meal emphasised both our emergent understanding of ‘who decides’ along with the shared concern at both sites to understand the spatial regulation of our food habits. 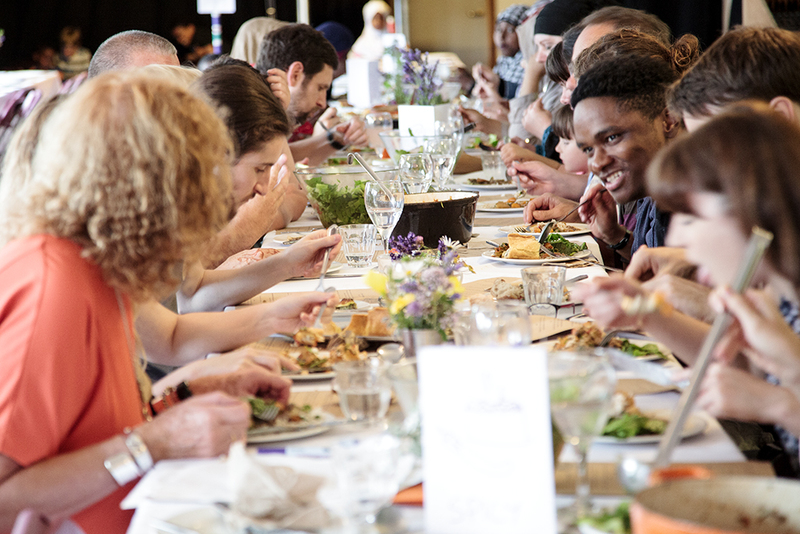 It also reflected the quite different food cultures and ideas that have developed at the two sites, leading to a rather spectacular hybrid menu of Somali and British cuisine using local produce, wonderfully prepared by the Hamilton House Community Kitchen. 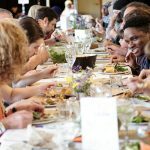 Over the course of the evening, attendees were asked to reflect on their food habits and think about what they would like to change in the future. 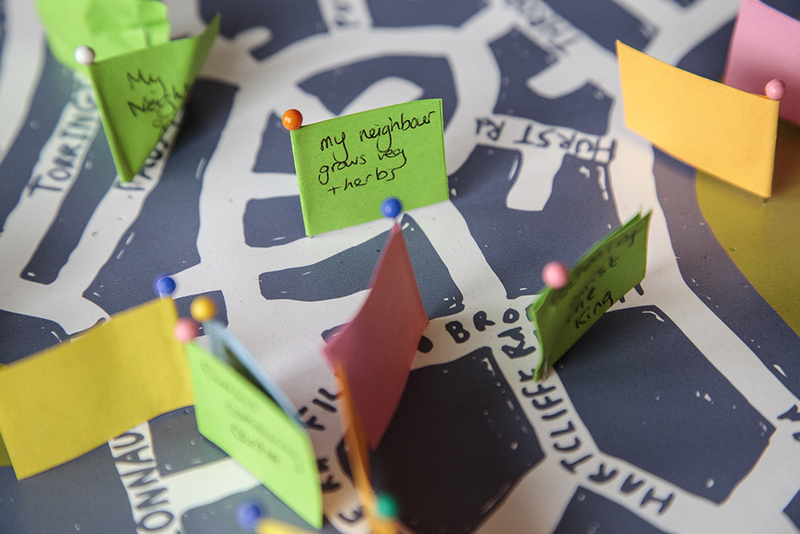 A creative data collection installation in the form of an interactive fridge, created in KWMC during the project by 8 ‘junior digital producers’ had been used extensively as part of the data collection in Knowle West and was part of the event. 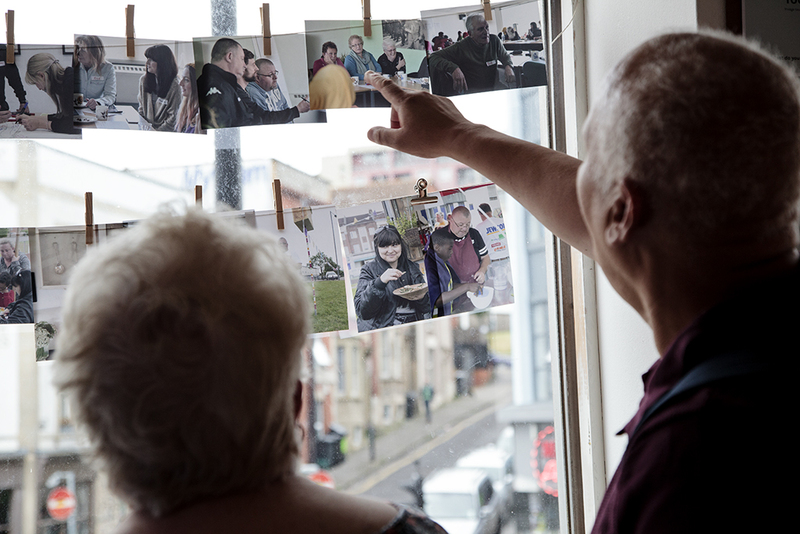 Project participants from Easton had heard about it but not seen it before and were excited to see it and undertake the survey. 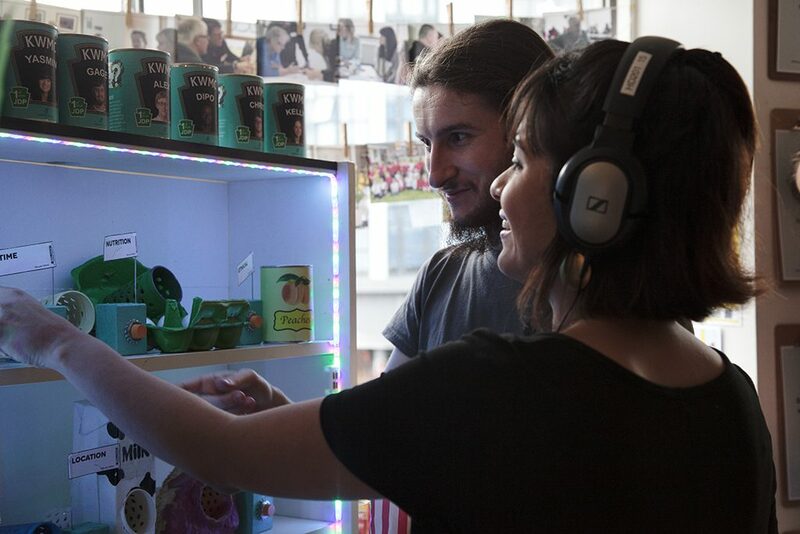 An interactive ‘fridge’ survey – that had been built to gather quantitative data about food habits in Knowle West – was on show at the event. Before dessert everyone was asked to move seats and sit next to somebody they didn’t know. Everyone was relaxed and this led to some really rich conversations and exchanges. 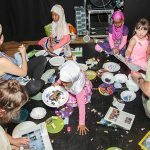 The concept of a food utopia helped us to look forward beyond the project to addressing the regulation of our food habits in transformative ways. 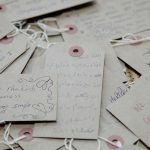 Towards the end of the meal, over chai tea and dates, there was a particularly poignant moment when children of participants volunteered to read out the visions, hopes and dreams that had been written during the evening. Click on the images below to look through more photos from the event. Over welcome drinks, participants were invited to look an an exhibition that displayed project matierals, key findings and photos that told a sort of the project. 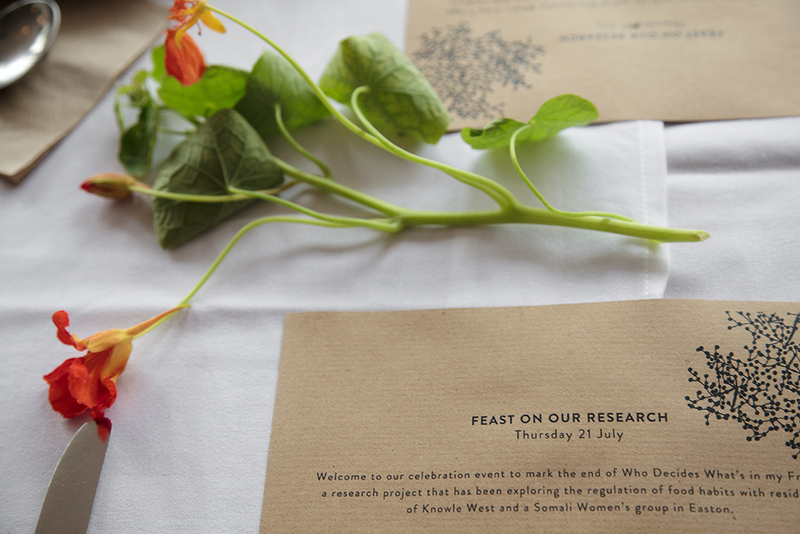 The menu was inspired by the community participants and the research we had done together. 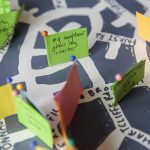 Local residents had crowdsourced an ‘alternative food map’ of Knowle West, pinpointing local growers and producers. 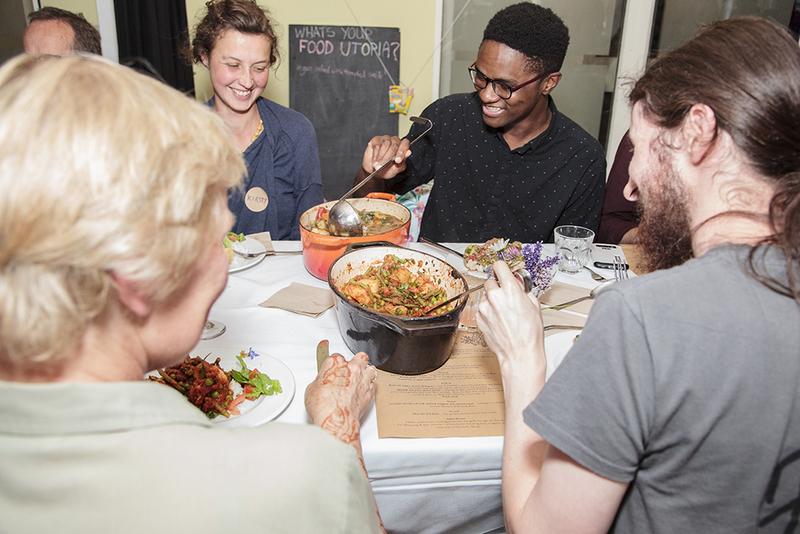 Over each course participants were asked to reflect on their food habits with their neighbours. 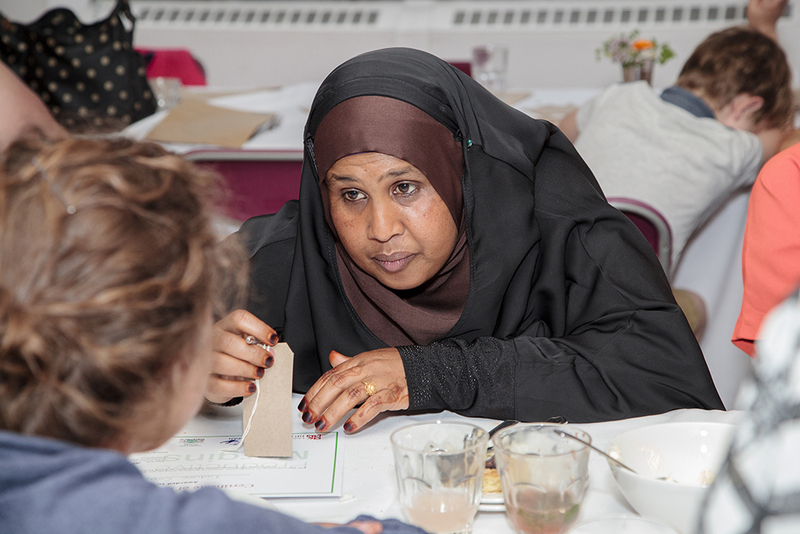 Participants enjoyed trying new foods – a delicious fusion of Somali and British cuisine! 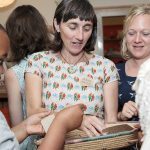 Key to enabling participants was having a playworker employed at the event. 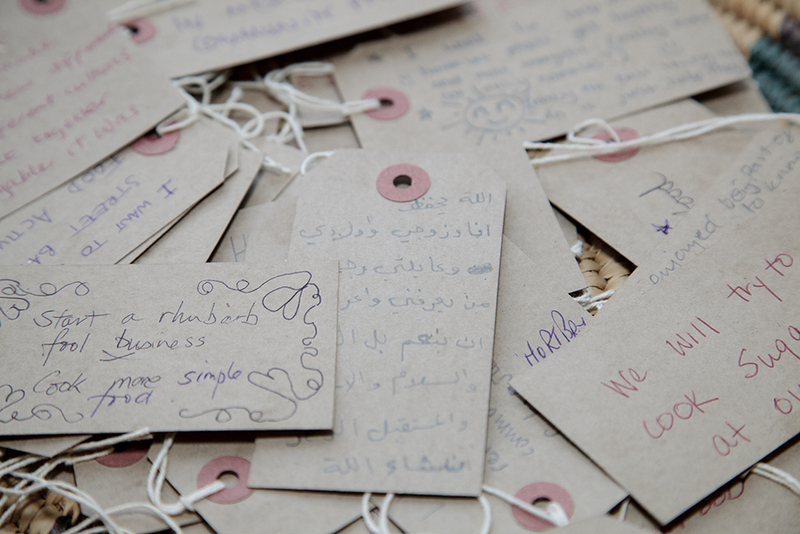 Participants were tasked with thinking what they would like to change in the future. Over dessert everyone was asked: What would we like to continue doing as a result of the project? 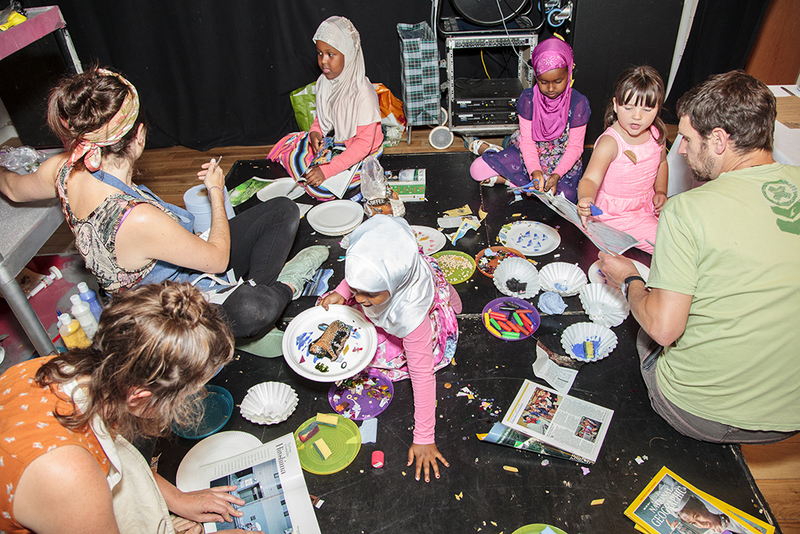 Children volunteered to read out the visions that had been collected during the evening. © 2016 - 2018 Productive Margins. All Rights Reserved.